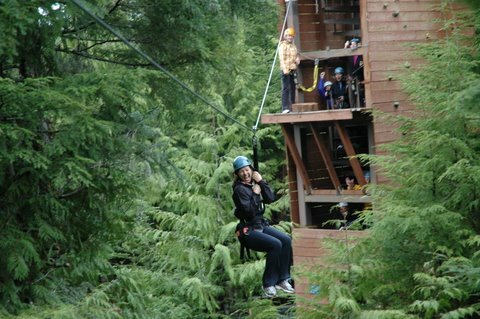 I was in the midst of a zip lining and canopy ropes course near Ketchikan, Alaska. This was the day’s shore excursion from our cruise ship, the Carnival Spirit. Southeast Exposure will pick you up from the cruise ship dock, transport you to and from their location about 20 minutes away, and provide you with 3 hours of adrenaline pumping adventure. The friendly and highly competent staff supplied our group of 11 with harnesses, helmets and pep talks for the scaredy cats. The safety briefing was thorough and succinct; a combination of ‘have one carabiner attached to the cable at all times’ interspersed with ‘just don’t be stupid’. I appreciate that kind of real talk. They also accompanied us to the best bar in town, Fat Stan’ s, after our adventure…now that’s service! The course itself consists of a series of zip lines, 7 in all, progressively higher and longer as you proceed. The final one requires a running jump at the start to make it all the way across. The zip line segments are broken up by several challenges, one of which I was currently facing. Others (too scary to ponder at the moment) include a rope bridge and a tightrope. The staff offers advice on how to most effectively cross the obstacles. They fly easily between the trees to offer help to us and each other. They no doubt must have taken several kicks to the gut as we careened wildly out of control to our landings. Once the zip line and ropes course is finished there is an option to try your hand at rock-climbing. A bell tower with climbing grips has 3 walls for varying levels of experience.